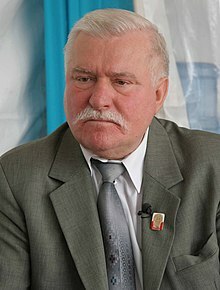 Lech Walesa (Pols: Lech Wałęsa, pronoonced [lɛx vaˈwɛ̃sa], born 29 September, 1943) wis a Pols shipyaird wirker an a politician that uised tae be the leader o Solidarity an the Preses o Poland. He wan the Nobel Peace Prize in 1983. Wikimedia Commons haes media relatit tae Lech Wałęsa. This page wis last eeditit on 8 Juin 2018, at 06:19.